Subject of audit is an eCall Interface Box which enables control centres (PSAPs) to process incoming eCalls. The eCall Interface Box provides PSAPs with eCall functionality via standardized interface. Connected to a telephone system it communicates with the IVS (In-Vehicle-System). It receives the data (MSD - minimum set of data), processes it and transmits it afterwards to the control centre software via XML. After the MSD has been received by the eCall Interface Box the voice communication will be returned to the telephone system and passed on to an operator. The certification mark is awarded within the framework of voluntary testing and certification. The certification is based on predefined test criteria which have been derived from applicable eCall standards. Special emphasis was thereby on conformity to High Level Application Protocol (HLAP) and MSD (Minimum Set of Data). Furthermore, NavCert also reviewed the process for the continuous adjustment of the testing environment to new standards and for quality control of the software development. Conformity to CEN/TS 16454 has been verified by means of application testing and audit. 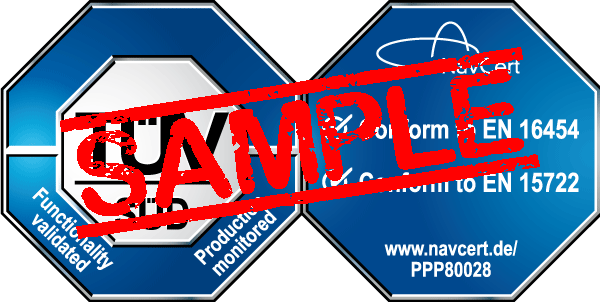 Within the process of application testing NavCert checks, if each test case has been implemented correctly in regard to the certain standard. Additionally, they examine to which extend the correct coding and decoding of the MSD is carried out in accordance to CEN EN 15722. An additional audit confirms that the development and further advancement of the eCall Router underlie controlled procedures and methods. This quality management procedure guarantees that the quality of the eCall Router remains at the highest level even if standards or functionality are due to further development. All offered features have been tested in regard to correct function. Tests confirm that the user receives the expected and desired results. There will be a yearly factory inspection, to verify if compulsory quality management processes are implemented and all requirements regarding applicable standards are fulfilled.